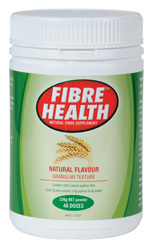 Fibre Health is a daily fibre supplement made from 100% natural psyllium fibre. Psyllium is one of nature's richest sources of dietary fibre. Fibre Health is an easy and convenient way to supplement your diet with natural fibre. Fibre Health is equivalent to Metamucil Natural (Reg TM Procter and Gamble Australia Pty Ltd) & is available 48 dose (336g) packs. Fibre Health is less expensive than Metamucil Natural. It helps you maintain a healthy digestive balance and restores regularity. In addition to maintaining regularity, dietary fibre can also help lower cholesterol. Each 7g dose contains 3.4g psyllium husk powder. Store below 30°C. Made in Australia.